Kids can practice their scissor skills and learn more about patterns in this kindergarten activity worksheet. They should cut out the cute animal images and then paste the image that completes each pattern in the last box. 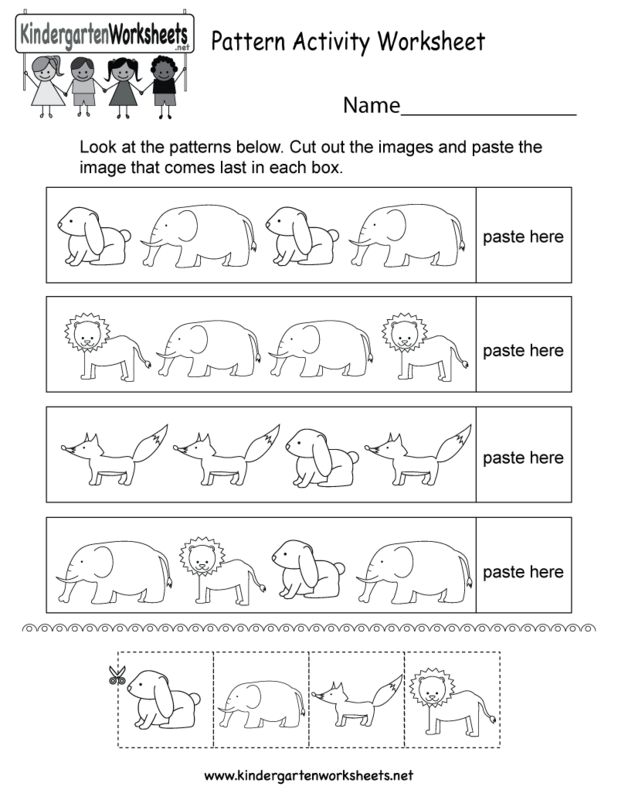 This free kindergarten patterns worksheet can be used three ways. Kindergartners, teachers, and parents who homeschool their kids can print, download, or use the free pattern worksheet online. There are three icons above the free pattern activity worksheet. The first is labeled "Download" which will prompt you to download the PDF version of this kindergarten worksheet. Printing the PDF of this math worksheet will produce the best results. The second icon is labeled "Print". Selecting this will take you to another web page that only has the pattern activity worksheet so that you can print the worksheet inside of your browser. The third icon is labeled "Online". This will take you to our kindergarten web app where you complete the pattern worksheet using your computer, iPad, or other tablet device.